The Ministry of Transport has proposed the Government allocate VND932 billion (US$40 million) from contingency reserves for the My Thuan-Can Tho expressway project to entice businesses to invest in the project. The construction of Trung Luong-My Thuan Expressway is underway. Illustrative image. The sum is part of the total investment for project of VND5.4 trillion (US$232 million), but the ministry has proposed disbursing it now to complete land clearance work to find an investor for the project. 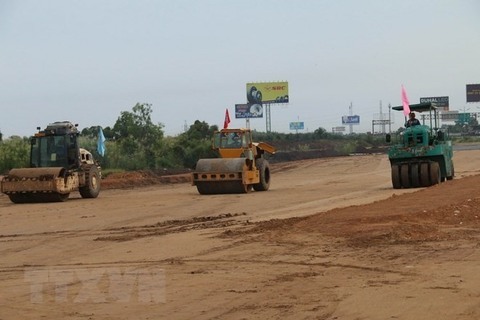 Potential investors have been reluctant to get involved, largely due to the Law on Management and Use of Public Assets which took effect in January this year, which dictated that they must win a tender to collect toll fees on the HCM City-Trung Luong Expressway to fund the My Thuan-Can Tho expressway project. Previously, Thang Long Management Board under the Ministry of Transport submitted a shortlist of investors to the ministry. However, with the change in legal documents, the selection process for project’s investors must be conducted again. Eleven investors, including those from the Republic of Korea and China, have expressed interest. Earlier in 2016, then Prime Minister Nguyen Tan Dung approved the My Thuan – Can Tho Highway project in the Mekong Delta being conducted under the build-operate-transfer (BOT) mode. Accordingly, toll booths would be built on the HCM City – Trung Luong Expressway (from the city to Tien Giang province) to fund the project, and also on the new highway once completed. The volume of vehicles on this route will increase rapidly in the coming time, especially after the construction of My Thuan 2 Bridge, it said.